WATERLOO – An eastern Iowa mother has been arrested after a passing driver noticed her young sons unsupervised and trying to cross a busy highway in the rain last weekend. The motorist circled back and sheltered the two boys -- ages 3 and 4 -- in a vehicle until officers arrived. 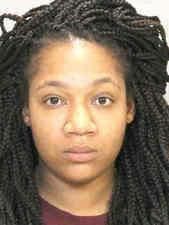 On Tuesday, police arrested Britney Lashay Grundy, a 28-year-old with a history of leaving her children unsupervised, for two counts of misdemeanor child endangerment. Her bond was set at $5,000. The driver spotted the children at the intersection of Highway 63/Logan Avenue and Arlington Street preparing to cross around 4:22 p.m. Saturday, according to the police report. Officers went to Grundy’s Cutler Street home, but no one answered. About two hours later, Grundy called the police department looking for the children, the report states. At the time of the incident, Grundy had 14 pending jail days to serve in connection with a June 2014 home-alone case. In that case, authorities were called to her Leland Avenue apartment at 2:35 a.m. after neighbors heard one of the children crying and found them unattended. The neighbors took them to their own apartment. Authorities found the youngest child’s diaper was excessively wet, and officers determined the children had been left alone for almost four hours, according to court records. Grundy was sentenced to probation and community service. Then in November 2017, police went to the Cutler Street address after dispatch received a 911 hang-up call and heard children on the phone. A barefoot 3-year-old in a diaper answered the door and let the officer inside, and police noticed a 2-year-old in the house and found Grundy passed out on a couch lying on a small wine bottle, court records state. Court records allege a court order in the 2014 case had barred her from being with at least one of the children without Department of Human Services supervision at the time of the 2017 police visit. Charges in the 2017 incident were ultimately dismissed. An earlier brush with police in a May 2011 traffic stop led to charges of operating while intoxicated and child endangerment, according to court records.